A newsletter designed with OrlandoMQG members in mind! Happy February! This is sure to be an exciting month. It's the end of the guild's calendar year, so we will soon be welcoming a (mostly) new board and QuiltCon in Nashville is the 21st - 24th! This month's meeting will feature membership renewal and sign-up for Michelle Wilkie's April 6th class. Our 2018 Interest Groups wrap up this month so bring your projects from the year to share. Cre-active Club will also be having a Show and Tell for the last couple months of WIP projects. A new policy: NO food or drinks other than water are allowed in The Sewing Studio Classroom. If you have any questions, comments, or suggestions regarding the newsletter, please email me. I would also love to hear of any quilty news or ideas for content you'd like to share. Constructive feedback is always welcome. Wednesday, February 6th is our guild meeting at The Sewing Studio 10-12. Parking is once again permitted at the gas station next door when The Sewing Studio lot is full. Bring your Block Lotto block(s). Each block made earns you one ticket in the raffle of ALL blocks. The more blocks you make, the better your chance of winning! Here is the current block's details. Bring your finished projects for Show and Tell. Remember to bring you Bee Blocks for your Bee Groups. All books checked out from the guild library need to be returned by Wednesday's meeting. If you checked out a book but will not attend the meeting, you need to make arrangements to give the book to someone who will. Check the link on our blog to see what books are in our inventory and to add books to the ongoing wish list. Members receive a 15% discount at The Sewing Studio on guild meeting days and a 10% discount on non-meeting days. Monday, February 11th is the Maitland Sew Day. Saturday, March 2nd (10am - 1:30pm) is the Dr. Phillips Sew Day. Saturday, February 23rd (9am - 3pm) is the Oviedo Library Sew Day. Block of the Month (current and past) instructions, meeting minutes, Calendar dates, and more can be found on the guild blog. The incoming board is looking for members to chair or work on various committees, interest groups, and bees. Please contact Ede or Yanick if you are interested. Please continue to make those placemats for Meals on Wheels. We have had such a wonderful response, keep them coming to dress up someone’s dinner table. If you would like to join us and assist with the show, we will need about 5 people to help with loading and unloading and displaying the quilts. If you have a favorite quilt that you would be willing include in the trunk show get it to Marge Cree or Kathy Aber by the February meeting. Please have your name on it with a brief description of why and how you created it. Your name will ensure you get it back. Also, if you have a quilt in the Maitland Library exhibit and would let us include it in the trunk show, please let us know. We will get it back to you after the trunk show. If you have made a charity quilt and would like to donate to the residents have that to Marge or Kathy by the February meeting if you haven’t already done so. Depending on how many we receive will dictate how we will distribute. If we have enough for each resident attending, we will give them out. If not, we will hold a raffle to give away. 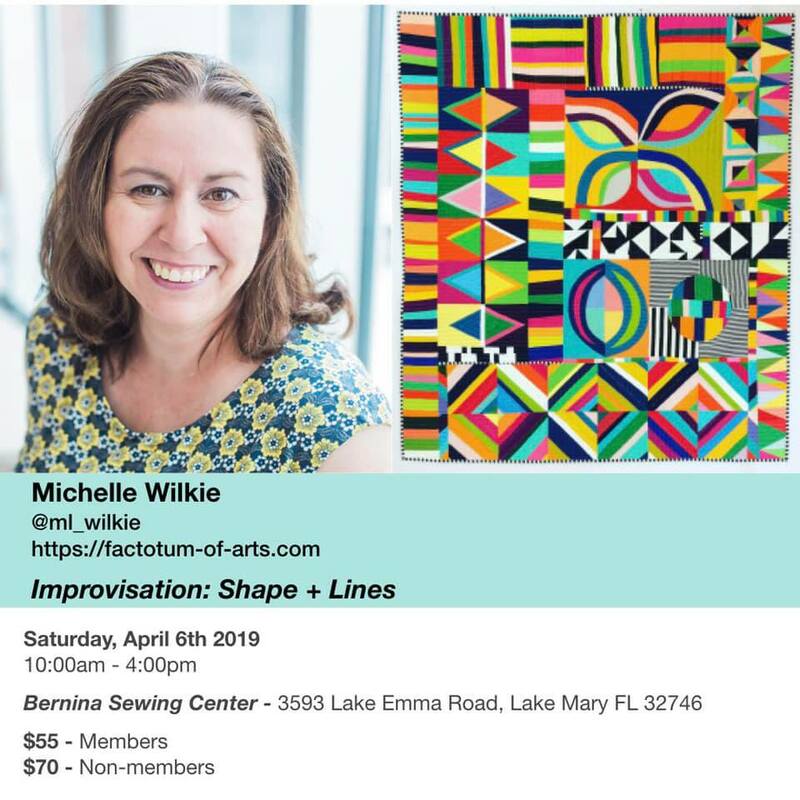 Broward Quilt Week is March 4-10, 2019. They've shared their Workshops featuring Jean Wells and Tara Faughnan. 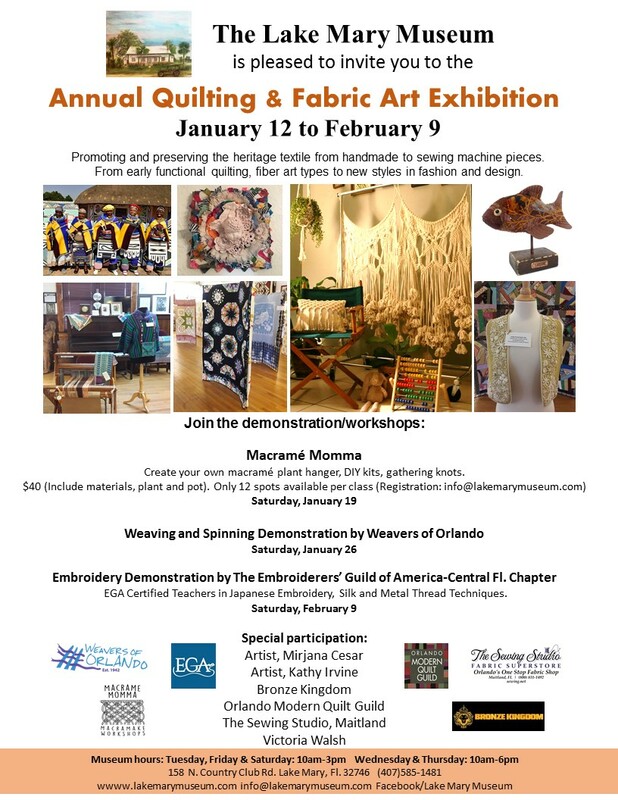 For more info visit Broward Quilt Expo. 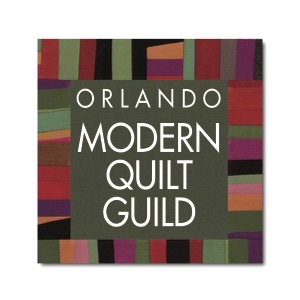 Thank you for being a part of The Orlando Modern Quilt Guild. We appreciate you taking the time to read our newsletter and hope you find it as interesting as we do! Do you know someone who might like this newsletter? Forward it to them. They can subscribe here. You can find the Orlando Modern Quilt Guild on these social media platforms.